Adjustable brackets allow you to personalize your display. 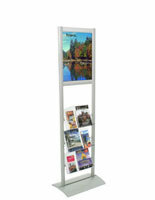 Includes (1) 24"w x 36"h poster frame to draw customer attention. 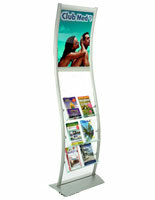 This wave display merges a literature rack and image holder into an amazing promotional unit. 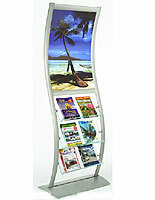 The store fixture, wave display is comprised of a 24"w x 36"h graphic area and (3) clear, acrylic compartments. 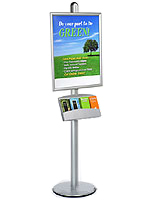 The wave display, also known as an informational unit, grabs audience's attention with the large poster frame, and leaves a lasting impression with takeaway brochures and pamphlets. 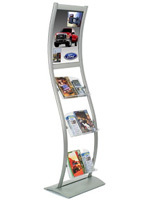 This wave display is constructed from brushed aluminum and has a sleek, silver finish for additional appeal. The aluminum is great for any high-traffic, indoor environment as it is rust-resistant. This image holder is also a double-sided wave display! 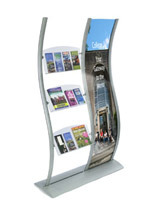 We provide the wave display with (2) clear, plastic lenses to cover and protect your posters. 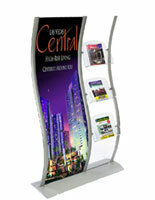 You can use the wave stand to attract customers in multiple locations. The clear pockets and open design will let consumers browse through your literature easily. 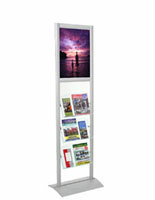 The free-standing unit, wave display features adjustable brackets to change the height of each pocket. Also, included with your unit is a 5-pocket literature divider for optional use. This wave display, such as our other wave-shaped fixtures, has a unique appearance to draw crowds to your presentation. Please Note: Graphic is not included with display frame. When designing your images, keep in mind the actual graphic size is 24"w x 36"h, where approximately 1/2" on each side is covered. Your graphics should be printed on regular poster paper, so as to ensure they will fit securely within the grooves. This will not be a problem for any printing service facility. 30.0" x 74.5" x 16.0"